Britain hopes to school China in its contentious public-private finance model. The idea underlines how different the two are. British schemes favoured private investors; in China the state remains in charge. The country has little need for accounting tricks to fund public goods. 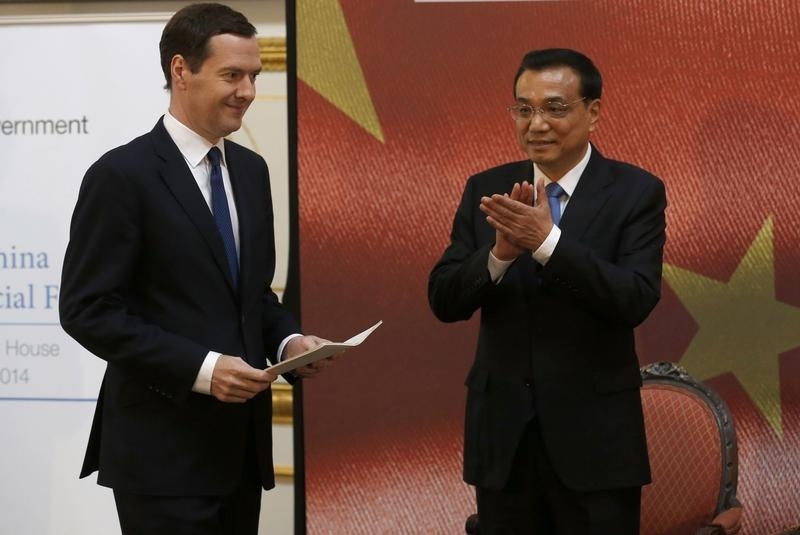 China's Premier Li Keqiang (R) applauds as Britain's Chancellor of the Exchequer George Osborne prepares to address the delegates of the UK-China Financial Forum at Lancaster House, in London June 18, 2014. UK Treasury officials will advise China on how to use private sector financing to build public projects like schools and hospitals, the Financial Times reported, including the use of private finance initiatives (PFI). China took in $2.5 billion of private investment into infrastructure in 2014, according to the World Bank. Since 1990 China has engaged in projects worth $131 billion, compared with India’s $335 billion over the same time. The World Bank counts only private investment, not that by state-owned entities. China introduced private-public financing partnerships in the 1980s, starting with the Shajiao B power plant in Guangdong. The Ministry of Finance and National Development and Reform Commission issued guidelines in 2014, flagging up sectors like energy, waste water and railways as potential targets. George Osborne, now Chancellor of the Exchequor, told the Guardian in 2009 that PFI was “totally discredited”. In 2012, the Conservative government launched a new variant of the technique called PF2, with higher equity participation and more risk borne by the government.